UTAR Wushu team reached new heights of excellence in winning a total of 10 medals in the Intervarsity Wushu Championship 2015 held at the Health Campus of Universiti Sains Malaysia in Kelantan (USMKK) from 14 to 15 November 2015. A 10-member team of UTAR Wushu exponents from Kampar Campus did the university proud by winning four gold, three silver, and three bronze medals. 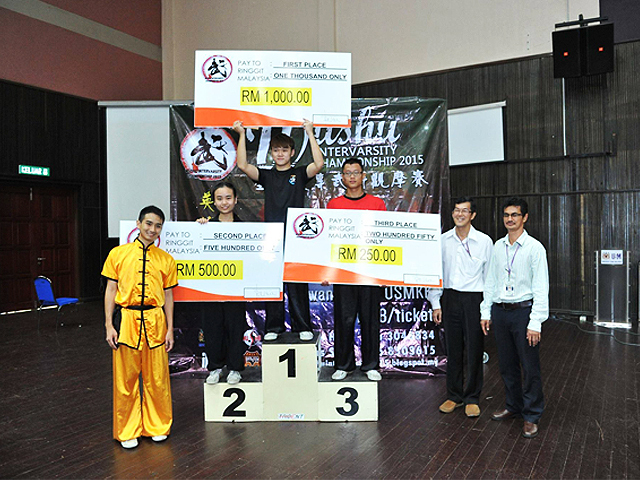 The team also won the overall second place award as well as a cash prize worth RM500 at the competition organised by the Wushu Club of Health Campus of Universiti Sains Malaysia. The four gold medals were raked in by Marketing student Liou Yik Wei, Entrepreneurship student Ng Keng Yit and Statistical Computing and Operations Research student Hoo Jia Ming. Liou clinched two gold medals in the men’s individual events, namely, southern broadsword and southern fist. His golden feat was followed by Ng who garnered a gold medal in the men’s traditional long weapon event. Meanwhile, Hoo secured a gold medal in the women’s traditional fist event. The silver medallists were again Ng, Advertising student Lau Min Jian, and again Liou for the men’s traditional fist, changquan, and southern staff events respectively. The bronze medallists were Construction Management student Chong Kah Wai and Lau again in the women’s individual traditional fist and men’s individual broadsword events respectively. Another bronze medal was awarded to UTAR for the overall group’s event. Hoo said, “I am very happy that I won a gold medal for the university. Hard work was essential for us to produce an outstanding performance in this championship.” Hoo added that the team had spent a lot of time training together and worked hard for the championship. The two-day annual intervarsity championship which was organised to promote wushu sports among university and college students had attracted participation from a total of 10 institutions of higher learning.